I strongly support the coming back of constantine…it’s dope! To add,it would be a grievous lie if i said i didn’t enjoy the constantine-arrow crossover.In fact,i was highly thrilled when i saw the two in arrow….. They both have a strong chemistry! I really want to see Constantine on his own show again. Thank you. I want to see Constantine come back, this is the bestest show ever!! Please bring him back soon!!! Yes please! NBC is famous for cancelling great shows! They need to give new TV series a chance. One season is some times not enough to prove the real potential of a series. Especially ones that focus on initial character development, which tends to frustrate shallow viewers who just want an exciting plot. David S. Goyer must have been gutted. It isn’t his first great TV show that has hit the sack. Da Vinci’s demons was a masterpiece! Please bring this back on CW or Netflix. YES!!! Bring back Constantine!! It should never have been cancelled. I’m almost 70 and love the show! The CW is the perfect place to show it. Supernatural is a big favorite of mine as well. I was never able to really get into Arrow, but Constantine, oh yes! Fingers crossed. Please bring Constantine back! I’ve signed petitions, commented on boards and told others about the short run on NBC of this show. Some of them weren’t even aware that it existed and were disappointed they missed it. It has a loyal fan base and the CW could deliver it properly. It would be a huge hit! 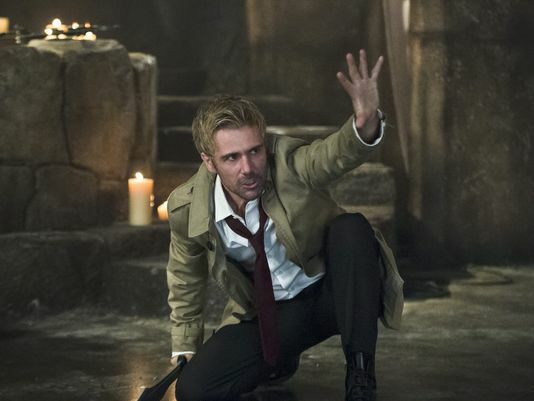 Should John Constantine (Matt Ryan) return to the Arrowverse ? – let me think, hmm, HELL YEAH ! I don’t know who actually has decision power to make it happen, i hope it’s just DC/Arrowverse showrunners and not more complicated do to this iteration of the character being from another production/network. BUT if it is the former than it would be great great. The Arrowverse has moved slightly to include outworldy/magical stuff with the likes of Damian Dhark, Vandal Savage etc. So, who better to lend a hand the an irreverent “Exorcist, Demonologist, and Master of the Dark Arts”. I was a huge fan of Constantine and of Matt Ryan PLAYING him. I am also a huge Arrow fan so if course when I heard of the Crossover I immediately planned to watch it. The two of these characters are made for each other. I feel like they are the “grown up” version of “Supernatural “. By the way I’m over 60 years old and sparkly vampires don’t appeal to me but I was a comic book geek Queen from the OLD days… So there you have it. Constantine was a great show ! Never should have been cancelled! I don’t watch Arrow I keep trying to get caught up but loose interest. I like both shows. I would like to see Constantine series come back, but if they are not willing make more episodes, I will settle for him being on the Arrow. CW seems like it is the place for supernatural stuff, DC shows and maybe Constantine will fit in. Smallville lasted 10, Supernatural is on the 11th season. ABC can be Marvel, CW is DC, but what definitely does not belong is Top Model. All these great shows, then there is top model. Yuck. Constantine should have been on the CW to begin with. It would still be on. It took a lot to get him on Arrow, as the actor had prior commitments. But his guest appearance really rocked. He would also fit in quite well in the Supernatural universe. Hope this isn’t the last we’ve seen of him.